Builders commonly used asbestos felt as a floor backing and roofing material during much of the 20th century. Many tradesmen suffered high levels of toxic exposure when working with asbestos felt in the past, and it can lead to serious long-term health consequences when it is uncovered in old buildings. Felt is a type of fabric made by compressing textile fibers and heating or moistening them so they mat together. Felt is usually made out of animal hair or synthetic fibers, but because of asbestos’s naturally soft, fibrous consistency, the fireproof mineral was also made into felt for construction and manufacturing purposes until its toxicity was revealed to the public. Roofing: Construction workers used asbestos felt as an underlayment for shingles, and it was also sometimes the main material used in built-up roofs. Flooring: Asbestos felt was often laid under linoleum, vinyl and asphalt floor tiles for padding and insulation. Paper manufacturing: Paper mills used sheets of asbestos felt as a drying surface for paper pulp. The asbestos content of these products was historically 85 percent, with almost all manufacturers using the common chrysotile form, also known as “white asbestos.” Because asbestos felt is friable, easily releasing toxic dust particles into the air when worked with or disturbed, it poses a major exposure risk. Asbestos flooring felt is one of the few asbestos products completely banned in the U.S., and regulations now require other products to contain less than one percent asbestos. However, old asbestos felt remains in the floors and roofs of millions of American buildings constructed between 1900 and 1980. In the early 20th century, modern building practices developed in the U. S. that made increasing use of asbestos. The so-called “miracle mineral” had gained a reputation for increasing the strength and heat resistance of anything it was mixed into, and it was in plentiful supply from North American mines. One of the pioneers of the asbestos industry, H.W. Johns, had made a fortune in the late-1800s by manufacturing asbestos-containing roof shingles, and in the early 1900s roofers began to use asbestos in the underlayment for shingles as well. Around this time, a new construction method called built-up roofing also became prominent, in which several layers of fabric covered with tar or asphalt were laid down on top of one another. Asbestos felt became the primary material used in many flat-topped buildings. The materials used in flooring also changed as the 20th century progressed. Linoleum, asphalt and vinyl floor tiles all offered cheap and durable flooring solutions, and asbestos felt products were available as backing materials for all of them. The rise of the office worker brought with it the rise of the modern paper industry, which found yet another application for asbestos felt. After trees are processed into wood pulp, the pulp must be dried before being made into paper. Laying the pulp out on sheets of asbestos felt allowed it to be dried at a high temperature, increasing the speed of production. By the 1980s, however, corporations could no longer cover up the link between asbestos exposure and fatal diseases such as asbestosis and mesothelioma. As with most asbestos products, the use of asbestos felt has largely been phased out in the United States, though it remains a threat to workers and homeowners renovating old floors and roofs. Asbestos felt is friable, making it a particularly hazardous product, no matter its percentage of asbestos content. Asbestos-related diseases are caused by microscopic asbestos fibers that accumulate in the body after being inhaled or swallowed. The mineral fibers have no smell or taste, and it usually takes 20–50 years for symptoms to develop after exposure. In decades past, asbestos felt products contributed substantially to the occupational exposure that now results in thousands of asbestos-related deaths among retired blue-collar workers each year. Most asbestos felt in homes and businesses today is encapsulated under floor tiles and roof shingles. 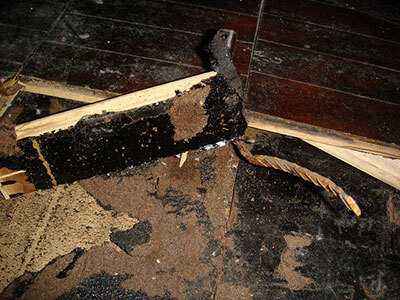 The safest thing to do in many cases is to leave it that way so asbestos fibers remain trapped. If roofing or flooring installed before 1980 must be repaired or replaced, a sample of the underlayment should be tested for asbestos before the work gets underway. Consult a trained asbestos abatement professional before doing any work that may disturb an asbestos felt product. Since the 1980s, thousands of construction workers and homeowners have filed lawsuits against manufactures of asbestos products after being diagnosed with illnesses such as mesothelioma and lung cancer, sending many companies into bankruptcy. For example, in the 1990s floor-covering contractor Robert Ehret developed mesothelioma after installing asbestos flooring felt with floor tiles and sheets for two decades. He filed a lawsuit against several manufacturers, including Congoleum, which had manufactured asbestos-containing flooring products from the 1950s to the 1980s. Mesothelioma took Erhet’s life before he could go to court, but his wife received an award of more than $3 million. Another major manufacturer of asbestos products, Armstrong World Industries, was driven to bankruptcy in 2000 by the volume of lawsuits filed against it. As part of its reorganization, it established the Armstrong World Industries Asbestos Trust in 2006 to provide compensation to present and future claimants. According to the trust’s 2014 annual report, it paid almost $100 million in claims that year, and its total value was about $1.8 billion. U.S. Environmental Protection Agency. (1994, August). Applicability of the Asbestos NESHAP to Asbestos Roofing Removal Operations.